Author Neil Gaiman shares his favourite writing. With Peter Capaldi, Nina Sosanya, John Finnemore, Mitch Benn and Ukulele Orchestra of Great Britain. Recorded at the Radio Theatre. Neil Gaiman shares the writing that he loves. With actors Peter Capaldi, Nina Sosanya and John Finnemore and music from Mitch Benn and members of Ukulele Orchestra of Great Britain. Recorded in front of an audience at the BBC Radio Theatre. Extracts from Neil's favourites: Mary Poppins Comes Back by P.L. Travers; a delightfully funny short play, Fair Mistress Dorothy by A.A. Milne, performed by the whole cast; Charles Dickens' gruesome 'Captain Murderer' story from The Uncommercial Traveller and the poem Differences of Opinion by Wendy Cope. Alan Moore's song Me & Dorothy Parker performed by Mitch Benn, a clip of BBC radio series The Hitchhiker's Guide to the Galaxy by Douglas Adams and two ukulele songs round off the show. Neil Gaiman’s Norse Mythology conjures a world of gods, monsters and trickery. 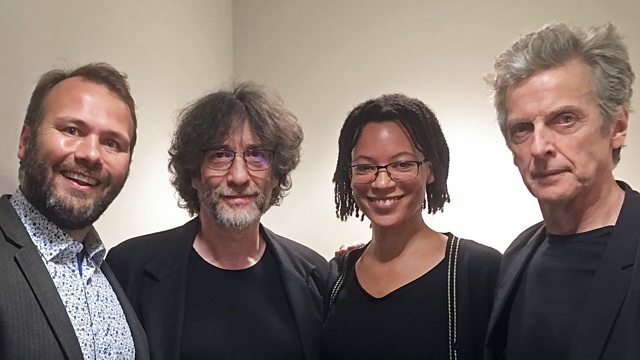 Neil Gaiman reads "The Secret Book of the Dead" by Terry Pratchett.